When it comes to cake decorating as a creative pursuit the actual design and having free reign over the cake design is one of the most creatively satisfying processes of the job, yet as a cake decorator I found one of the toughest aspects of the job was getting clients or potential clients to see your vision for their cake. When given free reign I felt I produced my best work. Having no guidelines or a basic colour scheme to work with the process of designing and decorating took on a life of it's own. As the cake comes together it almost speaks to you. The design you started with morphs into something new and usually, hopefully something better. 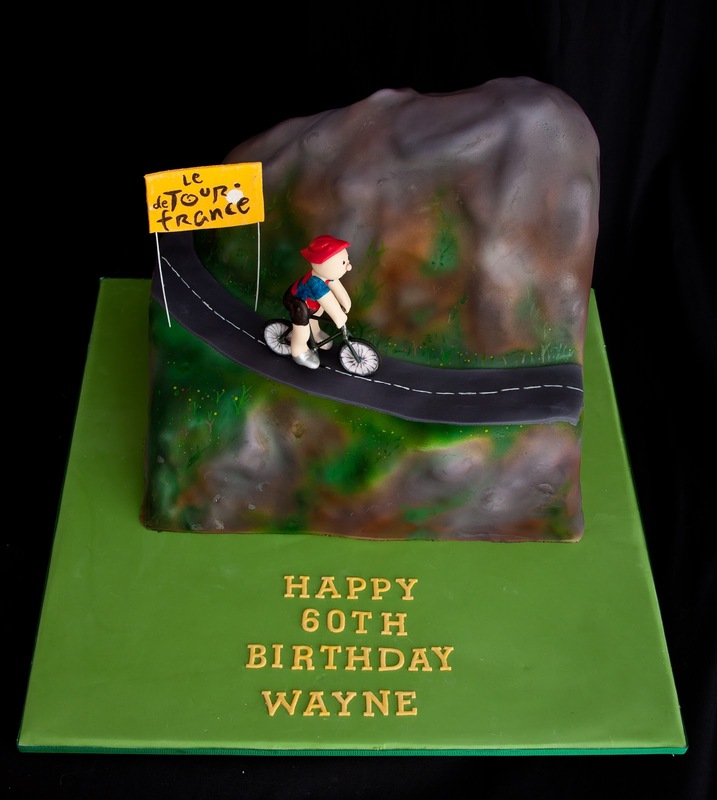 The cakes I have had the greatest feedback from and response online have been purely my own design. Often they are cakes I made for myself like my 30th Birthday Cake that was selected by CosmoBride to appear in their Spring weddings special. 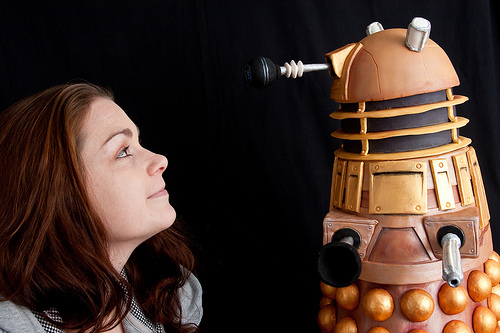 That cake was entirely my own vision. I didn't source that look from elsewhere, the solid bright colours were something I hadn't had a chance to work with in my work for clients. It felt bold and fun and I was amazed when it paid off and I got that phone call from Cosmo and was beyond proud when I saw it in print. The problem is your vision is just that.... your vision, not your clients. It exists in your head and is bound by your aesthetic. To present that vision as a description or a sketch it loses something in the process. It was near impossible at times to convince brides and grooms to be that you could create a unique, stand out piece for their wedding. 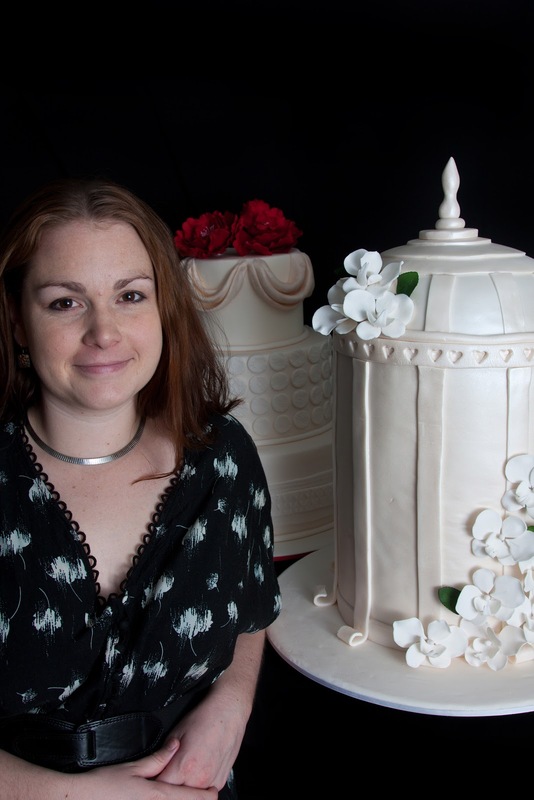 I often found clients were more comfortable choosing an image off the internet that is in line with their aesthetic and simply getting a quote on that pre-designed cake. In doing so they are simply looking for a cake decorator with the technical ability to build someone else's design and not an artistic interpretation of their needs. There are a number of problems with this. 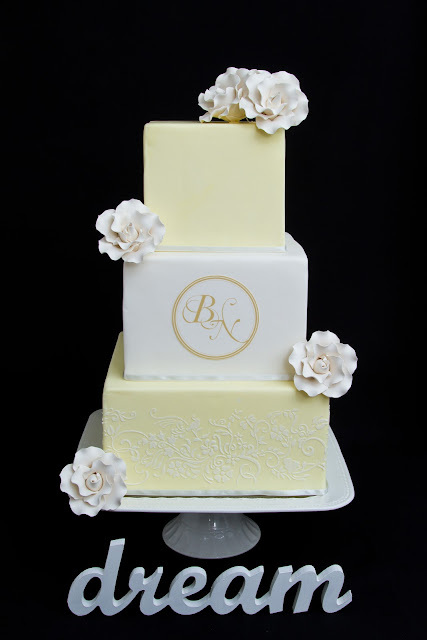 Firstly your clients don't get an original cake, you find that some cake designs get re-hashed over and over. You see them in different colour schemes all over the place and it is dull dull dull. The second problem is there is no room for creative licence. If a client has paid for a set design that is what they want. As the cake is formed it doesn't have the freedom to be anything special, to take on those unique flairs that are the true skill of a good decorator. At times I have called clients with changes I would like to make and often that was met with interest but at times that was all too hard. The client wants a replica of the design they had already found, no matter how dull. The final problem from the decorators perspective is that you can never form your own style and that is the greatest loss of all. If you aren't sure what I mean by your own style or aesthetic I would recommend taking a look at the work of Ron Ben Israel. His abundance of finely hand crafted flowers, fine details and pure elegance are unique to him. I can spot a Ron Ben Israel cake a mile off. Every cake is his vision entirely and I would love to know how he doesn't compromise that vision in the face of clients wanting reproductions of the work of others. However he does it he has created his own brand. 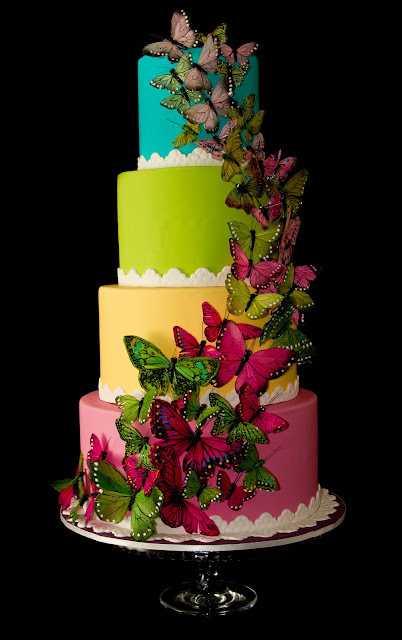 Every cake screams him and what he is about, there is no mistaking his work, his aesthetic precedes him. Ron Ben Israel is the best example of why all cake decorators should doggedly pursue your own vision. Your work becomes your brand, you will become known for the work you produce and the clients will follow. Not only that but you will be fulfilled in only producing work that excites you, that speaks to you and about you. At the end of the day we all got into the game for the creative pursuit. I don't know a single decorator who got into the game for the great wads of money because it just isn't there. So if we are all pursuing a creative vision and satisfaction why not do it your own way. Do better than I did, work endlessly at your aesthetic, make your clients see you aren't merely a robot there to produce the work of others, create what you love and love doing it. Some of my first wedding cakes. The back cake I created as my first display cake to show off my work and the front cake I was given the brief to create a Bird Cage. That was a challenge and I didn't want it to be heavy with clunky black bars. the client trusted my vision of the white on white. Another of my first display cakes, I loved this cake as it was all my own vision and it was so popular for weddings. I must have made different versions of this cake a dozen times. The brief: Make a mountain with dad riding down it in the Tour De France. Okay. The brief: Stacked suitcases. 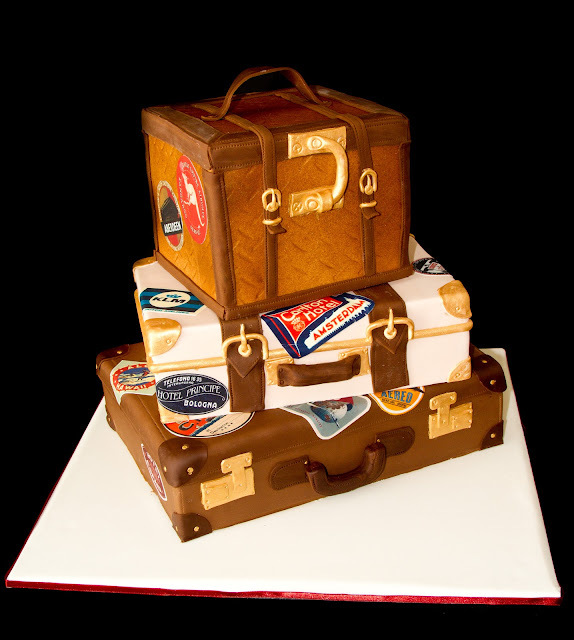 the client trusted me to design this cake and do my own thing with the vintage travel stickers. So satisfying. My first uber Sci- Fi Cake. 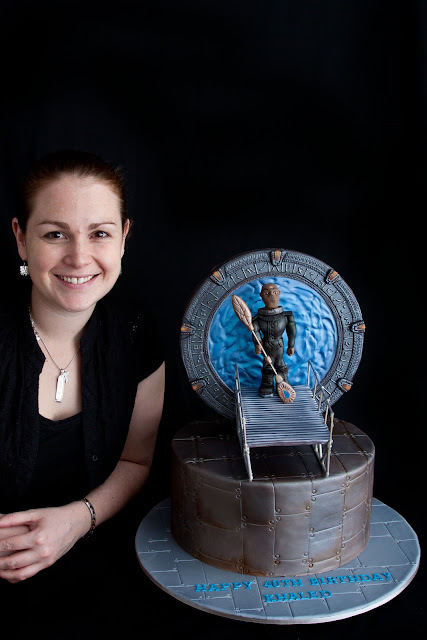 The brief: A Stargate cake with Teal'c on it. Luckily my hubby is a Stargate fan and made this replica of the gate to exacting precision piping on all the tiny gate details to match the real thing. This was my first chance to cut loose with the metallic airbrushing, the client was beyond thrilled with the results. The clients let me get totally carried away with this one. This is the cake where I learnt that exceeding expectations makes for some very happy clients. 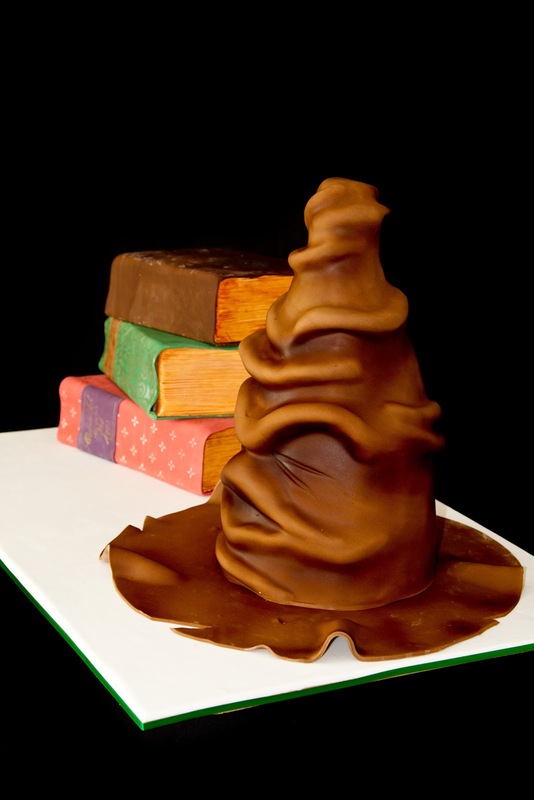 Making the sorting hat and designing the mystical books of Harry Potter was very creatively satisfying.